Playing at home yet again, subcontinental juggernauts India were invincible as they swept an underwhelming West Indian side by a whopping margin of an innings and 272 runs to record their biggest Test win ever. Debutant Prithvi Shaw became a household name with this match, as he claimed the Man of the Match at debut. With India leading 1-0, the action now shifts to Rajiv Gandhi International Stadium, Hyderabad, where the Caribbeans would be fighting to salvage pride. For India, it would be the last chance to test their bench strength and figure out the best squad ahead of the tour to Australia in November. 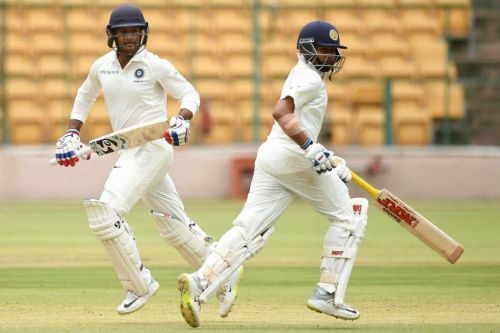 Prithvi Shaw, the latest entrant into Test cricket became an overnight sensation as he bamboozled the Caribbean bowling attack to become the youngest Indian to score a Test hundred on debut. The U19 skipper showed no sign of nerves and got off to his natural attacking game from the first ball, with none of the ball touching his pads. He bagged the Man of the Match honours for his splendid batting performance. Thus, it is the right occasion for him to maintain his form with the Australia tour in view. His opening partner, however, in this match should be substituted in favour of Mayank Agarwal, once again keeping the overseas assignments in mind. Irrespective of Rahul's duck at Rajkot, he has proved himself on the turfs of England and Australia in adverse circumstances. Thus, it would be prudent to hand Agarwal his Test cap and give him some match practice, as he is likely to be in the scheme of things at the top of the order against the Kangaroos in a month's time.